Pueblo Canyon derives its name from a group of cliff dwellings. The nearby asbestos mine named Pueblo Mine takes its name from the canyon. Look for an old mining road that crosses FR203 (Cherry Creek Road) between mile 23 and mile 24. There is a partially buried steel drainage pipe that crosses FR203 just before the mining road. Hike is described in Dave Wilson's book, "Hiking Ruins Seldom Seen". There are 4 distinct sets of ruins spread over the last mile of the hike. The site was first inhabited around A.D. 1290 and abandoned by A.D. 1330. Parking area for ruins (for GPS) is N 33 50.377’ W 110 51.924’ about 23.7 miles on FR203 (Cherry Creek Rd). Opposite parking area trail passes a sign and leads to the old mine road. Hike up the road staying along the ridge line, loose rocks everywhere so boots are better than tennis shoes. Trail will swing left but after entering the burn area you will cut back to the right and continue around to Pueblo Canyon. The first mile is tough and you gain 1000 feet, just 1500 feet to go! Now for the good/bad news: Good news, the Summer fires have burned all the manzanita so you don't have to stoop and bend through a tunnel of vegetation anymore. Bad news, as you approach the first ruins, and beyond burned dead falls block the trail so you have to climb over or crawl under these blacked beasts. White t-shirts no longer recognizable! Waterfall spectacular and was really flowing but very slippery. From Globe, take 188 north towards Lake Roosevelt. Turn right on 288 and follow about 2 miles past the Salt River until you reach FR203 (Cherry Creek Road). 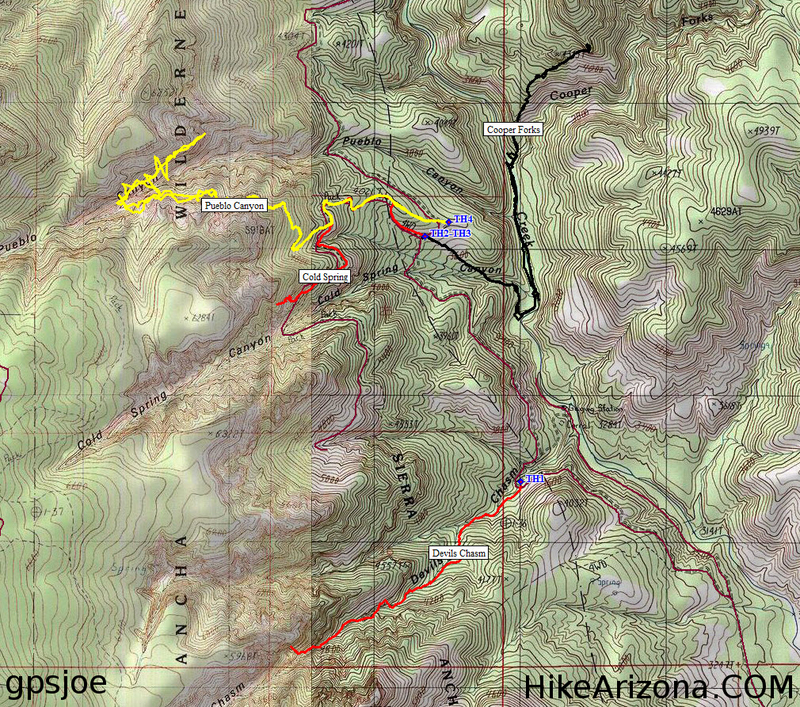 Follow FR203 for about 23 3/4 miles until you reach the trail head at an abandoned mining road. From Phoenix/Scottsdale either US89 then turnoff unto 188 through Roosevelt Lake to the Young Junction AZ288. Alternatively take I10 east to 60 to Globe, then turn north on 188 toward Roosevelt Lake. Turn onto Young road AZ288. From AZ288/188 junction drive 7 miles, over the Salt River and turn right on Cherry Creek road. 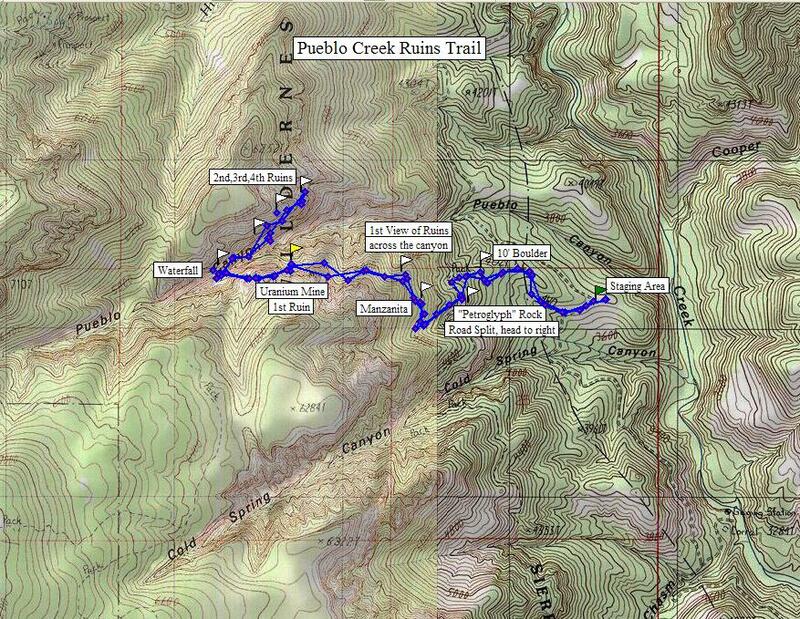 Take Cherry Creek road 23.7 miles to the trailhead. This dirt road will take about an hour to drive, if in good condition. Last summer's fires and Feb. 2017 rains have significantly changed some of the information about the road conditions and hike to Pueblo Ruins. Currently passable to the Devil's canyon ruins, but around mile 20 a large boulder blocks the road. A tight fit but we go a 4Runner through by carefully climbing the bank and angling through. Tough with a full size PU! Beyond Pueblo parking area, around mile 27 the culvert is destroyed and a 2-3 foot cut on the south bank prevented us from continuing on without destroying our from bumper. Quads crossed and some jeeps possibly could also but you could rip up or crush a truck front bumper. We turned around here.